This Roasted Acorn Squash is one of my favorite side dishes to make in the fall, and it’s one of the easiest acorn squash recipes you can make! Squash is one of those ingredients where you don’t have to do much to it to make it taste good. 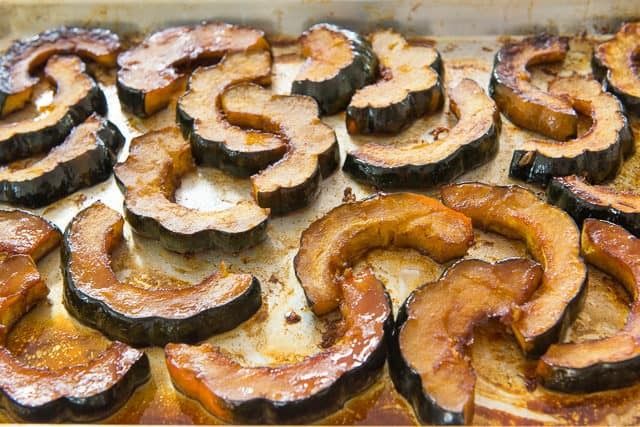 Because squash has a natural sweetness to it, I find roasting to be the best method, because it intensifies and caramelizes the sweetness and flavors in the squash. 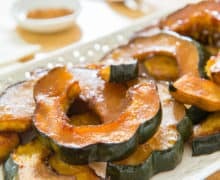 When roasting acorn squash, I like to cut it into slices to maximize surface area for browning, then add a little maple butter to it, which enhances the flavors and gives it a sticky glazed exterior. You can also roast it simply in slices with oil, salt, and spices like cinnamon or cloves, and end up with something delicious as well. Cutting it into slices is really worthwhile, rather than just roasting the squash whole or in halves. There are many varieties of squash, and each one is unique in its own way. The acorn variety has a flavor that’s more similar to a kabocha squash or traditional pumpkin, versus delicata or butternut. If you haven’t tried it yet, it’s time! I like using a melon baller to scrape out squash, because its edges are sharper than a regular spoon. 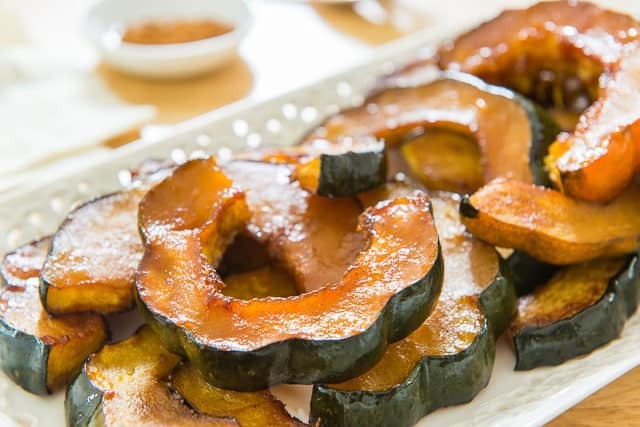 If you don’t wish to do the maple butter, you can also make roasted acorn squash with the oil of your choice, such a coconut oil, olive oil, avocado oil, etc, and spices like cinnamon, cloves, nutmeg, allspice, and ginger. 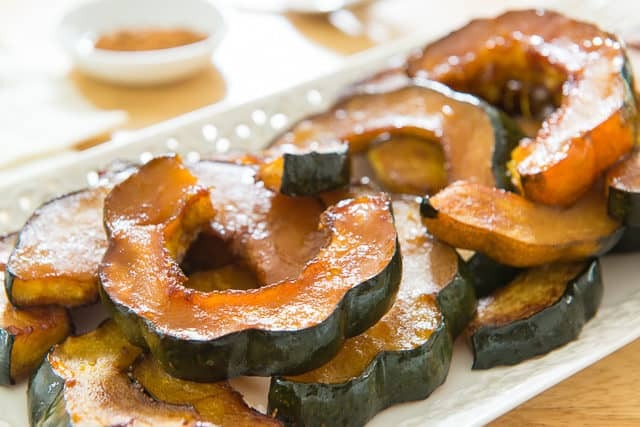 Can Acorn Squash skin be eaten? Yes, and I do eat the skins! Make sure the outside is washed well before baking. The one caveat is if the outside is heavily coated in wax, sometimes I’ll skip the skin. Simply peel the skin off before eating if you want to discard it. I find that easier than peeling before baking. Butternut Squash Soup is another one of my favorite squash recipes for the fall. Wash the squash well, then dry with a towel. 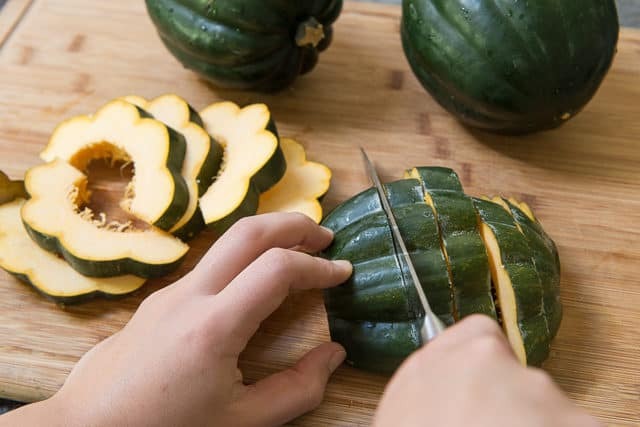 Trim the top and bottom off each squash, then cut in half from top to bottom. Use a melon baller or spoon to remove the inner seeds and strings. 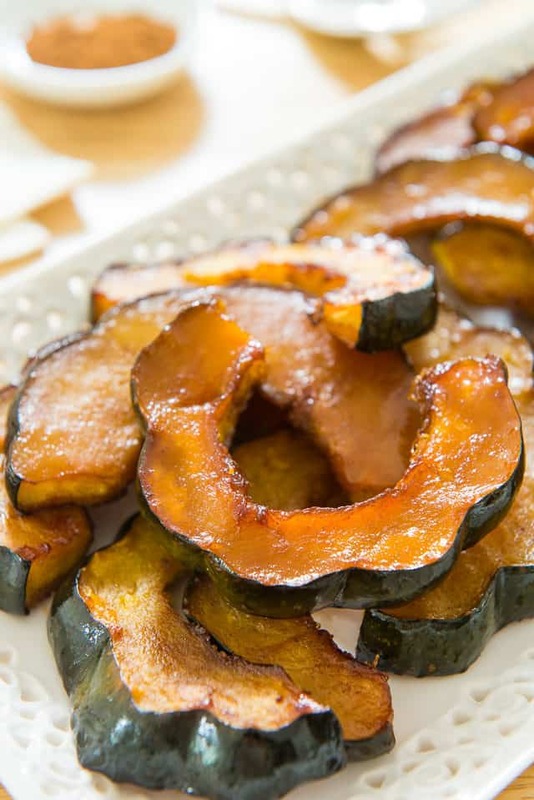 Lay each acorn squash half on its flat side, and cut into 1-inch thick slices. 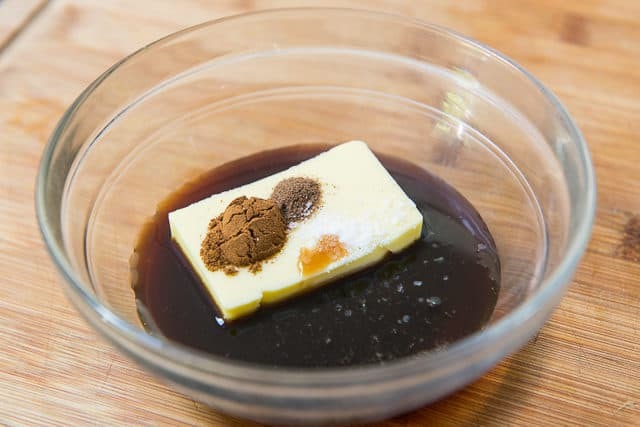 Microwave together the maple syrup, butter, cinnamon, cloves, and salt for about 60 seconds, until the butter has melted. Stir well with a spoon. 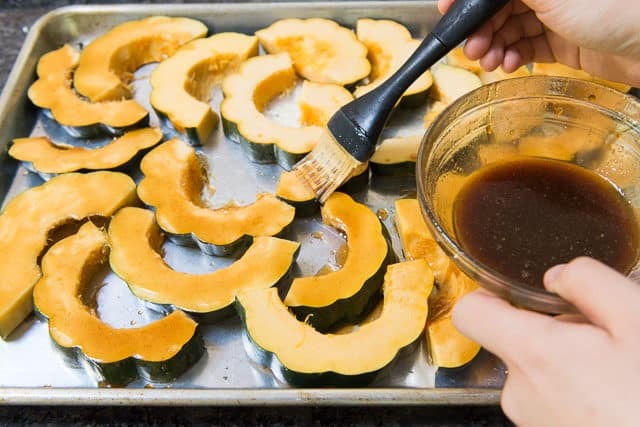 Place the acorn squash slices on a rimmed sheet pan in a single layer, then brush the maple butter onto both sides of the squash. 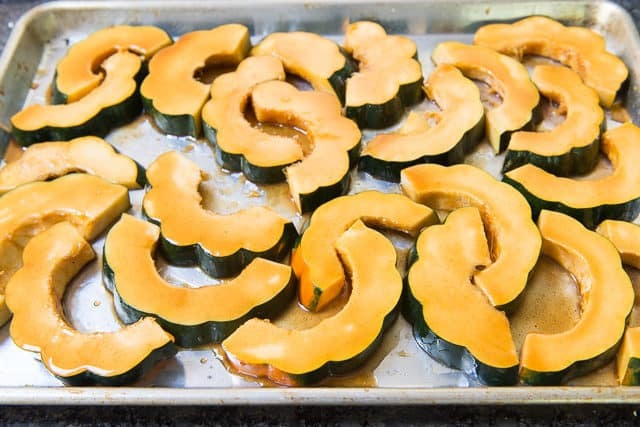 Roast the squash for 25 minutes on the first side, then flip each slice over and bake for another 15-20 minutes, until caramelized and soft. Enjoy! *The ones I use typically weigh 1.5 lbs each. **You may use other types of fat, such as coconut oil or olive oil. You may eat the skin of acorn squash. 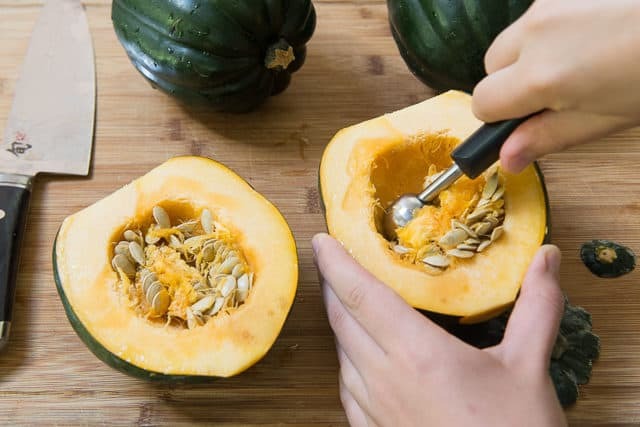 However, if you do not want to consume the skin, I find it easier to simply peel it off right before eating, rather than trying to peel the acorn squash before baking. Post updated in October 2018 with new photos, writing, and tips. Originally published in October 2012. This post contains an affiliate link. My whole family loved this! Even my picky 2 and 4 year olds! Thanks for a great recipe!